What is Bible Journaling? Everything You Need to Get Started! 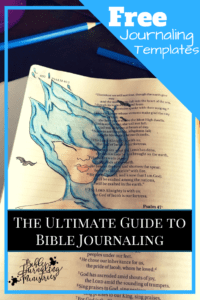 You are here: Home / Bible Journaling Tutorials / What is Bible Journaling? If you’re reading this article, it’s likely that you’re curious about Bible journaling. You’re in the right place! So what is Bible journaling? Bible journaling is your creative response to the Word. It can be done anywhere and at any time. Typically, Bible journaling is done in a Bible, but you can also use a journal, notepad, or devotional. There’s nothing formal about it. There are no rules. There are no guidelines. There are no perfect journals; it’s all about the way you want to respond to the Word as you’re reading it. Why is Bible Journaling Important? Some people prefer to keep their Bible journaling very private. That’s okay. Others use it as a way to evangelize and choose to share their reflections and art with the world. That’s good too! It’s your choice. You get to choose to respond to the Word with your creativity. 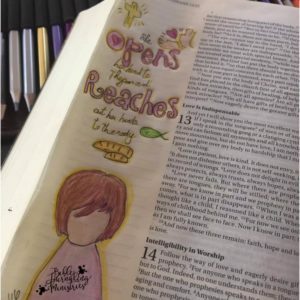 When I first started Bible journaling about fifteen years ago, my journaling was very, very basic. There were no drawings. All I did was write in my Bible. I remember sitting in church and hearing for the first time that it was ok to write in the Bible. In the middle of service, my pastor said, “Hey get out your bibles and start writing in them.” I looked at him, and I thought, “Why would you do that? The Bible is sacred. You don’t write in it. You just read it. That’s all you do with it.” I chuckle at this now because my Bibles are full of thoughts, images, and art. My pastor opened my eyes to engaging with the Word in a different way. The Bible is the resource for understanding the Word. If journaling or writing in it helps you understand and apply what you’ve learned, then Bible journaling is useful and worth it. Some of the first Bible journaling activities, I did in my Bible were simply jotting down notes. I would read scripture and write with a pen in the margin. When I would study the Word and begin to get bored or disengaged with the message, I would start writing in the margin. I would write anything that came to mind. Bible journaling helped me get through whatever passage was that I wasn’t particularly interested in, wasn’t calling to me, or wasn’t connecting with. As time passed, I started drawing in my Bible. That’s when Bible journaling started opening up a whole new way of studying scripture to me. I became so passionate about Bible journaling that I started Bible Journaling Ministries to help others experience the joy of combining creativity with the Word. Many people think that Bible journaling has to be beautiful and perfect. It has to be worthy of putting in a museum or a magazine. But, that kind of thinking will keep you on the sidelines, instead of truly experiencing the joy of walking with the Lord. Your Bible Journal is perfect the way it is. The first time I journaled in my Bible, I opened my mind to the Word, read the verse, and then I responded in a way that was creatively mine. The entire day was filled with joy. It was like the birds were singing. I finally connected with the Word in a way that brings me joy AND understanding of His Word. My first Bible journaling attempt. There are people out there that have the ability to make beautiful art in seconds. And I’ll admit that I’m not an artist. I’m a simple girl who writes for a living, but I’m also working to become better at digital art so that I can help share Bible journaling with more people. Over a few short weeks, I’ve seen a transformation in my bible journaling. My designs are getting better, and my knowledge of the Word is improving. Although almost all of my initial (and even my current) drawings use templates, I still consider it art. Bible journaling is important because, just like me, it may be exactly what you need to grow close to the Lord as you continue on your journey. To get started with Bible journaling, you need a writing utensil and paper. That’s it. If you want to know what I use, click here. The most common Bible Journaling supplies are listed below. What do you need to start your Bible journal? Well…you need something to write on, like a Bible. If you don’t have a Bible, you can use an online Bible, notepad, journal, or a piece of paper. You might be able to get one for free at your local church if you ask them. You may also be able to find inexpensive ones at your local thrift store. The next thing you need is a writing utensil. You need a pencil or a pen, and, that’s it. As you start to love it, engage with it, want to do more, you can get more crafty things. You can get embellishments, different types of pencils, and various markers. You can use stamps, digital images, magazine pictures, photographs, stickers, rub-ons, tape, and glitter. Die cuts, embellishments, anything you can sew in your bible will work fine. Felt, Stickles, embossing powder, decoupage, watercolors, all of that fun stuff, makes beautiful Bible Journals. The same thing you use for storing your craft supplies is the same type of storage that you can use for Bible journaling. I prefer having most of my supplies in a binder. It’s so portable. If I’m going on a trip, I can just grab my binder and head out the door. This image is included in the free Proverbs 31 Bible journaling template. I love to journal with digital images because I can download them and put them in my binder along with transparencies. I have a pencil case in my binder that contains scissors, washi tape, micron pens, a ballpoint pen, tape and carbon paper. Carbon paper is one technique that I use to transfer digital images onto my Bible. I put it behind the transparency and then start tracing the image to my Bible. The transparency helps with placement, allowing me to put the image exactly where I want it. Right now there is one free Bible Journaling template on our site, but I’m planning to release more of them as long as there is a need. These templates are for you to download, print out, and use for personal or ministry use. As I became more interested in Bible journaling, I started asking for supplies for my birthday and Christmas. 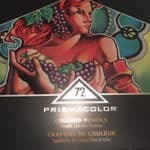 One of my favorite things so far is the Prism Color Premiere 72 count pencil set available at Amazon for 75% less than my local craft store. If you’d like to stay in the know when I find great deals, be sure to follow the Bible Journaling Ministries Facebook Page, where I will do my best to find the very best prices for you. Remember that you don’t need all of these things, so don’t let it stop you from moving forward with Bible journaling. Again, all you need is a Bible or paper and a pencil. That’s all you need! Bible journaling is a choice, and I believe that you should try it at least once. It’s a great way for you to engage with Scripture, engage with the Word, understand, reflect, and meditate on your journey. Consider what God is trying to say to you today. Pray, read scripture, and respond with journaling words and pictures. Journal any way you choose. Another great reason to start Bible journaling is to evangelize. The Bible says that we are to go out and share the word, and, evangelism is a perfect way to do that. I’m not saying that you throw your art in everyone’s face. But nothing’s stopping you from sharing it in a respectful, loving manner. You can share your creations on social media or in a small group. You could post it in your office if it’s allowed at your work. It’s totally up to you. The greatest thing about bible journaling is that it’s unique to your journey. It’s what you want to do with it. I hope that you get started, because it will change the way you engage and respond to the Word. It most certainly changed mine. I’m excited to share my first set of free Bible Journaling templates. Proverbs 31 is one of my favorite chapters of the Bible. I wanted my first set to reflect how I feel about the Proverbs 31 woman. While many of my sets will be free for a limited time, this set will be free forever. It is my gift to you. I’d love to see what you make, so tag Bible Journaling Ministries in your social posts or leave a comment below. Thank you! 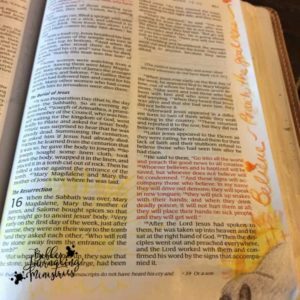 Now you don’t need to ask What is Bible journaling…because now you know! I love bible journalling. Wide margin Bibles are amazing, but I have also written in a separate notebook. I love it too! I helps me get closer to God because I spend more time in the Word now than ever before. Thank you for sharing Julie. How do you decide what scripture verses to read?